Children erupting from school house doors, tests and homework forgotten in the summer daze. Boats cutting crisp, curling wakes through lake water. Cloudless skies with molten gold sunbeams gilding the earth. Tanned toes curled in seaside sand with a froth of salt water whipped like meringue. High, wispy, sugar-spun, cotton candy clouds. Dawn-born day lilies brighter than Solomon’s finery but already fading by nightfall. Fireflies twinkling in the gloom while children with glass jars race across the dew-damp lawn. Sunflowers bowing in homage to their Creator as they trace the sun on its appointed track. The BOING of a diving board weight driven to its limits before springing back and launching laughing youngsters into a cannonball splash. Distant thunder of sullen clouds that have absorbed the day’s heat. Sandals flip-flopping and stick-stopping on hot asphalt. A neighbor’s lawnmower jumpstarting with a roar before subsiding into background noise. Tree frogs serenading the darkness, lonely voices seeking community in chorus. The off-key jingle of a childhood song as the ice cream truck stops and starts and stops through the neighborhood. Seven year cicadas a whir with the brief joy of life. The mournful dirge of a whippoorwill bemoaning missed chances and lost dreams. Baby birds cheeping impatiently in nests, snuggled among tree branches or shrub limbs, wide-mouthed and waiting for mama’s return. A bat’s crack and the slap of leather as baseball meets glove. Sizzling hamburgers smoking on the grill. Bouquet breezes with an intoxicating aroma of honeysuckle, jasmine, and gardenia. The green smell of fresh mown grass that lingers in the air. Coconut oil scented lotions that evoke images of exotic locales and past vacations. Chlorine drenched children wrapped in towels beside the pool. The smell of rain still hoarded in the depths of cloud cisterns, waiting to quench a parched earth. Humidity so thick that a glass of water could be wrung out of the air like a soaked bath towel. The heart-stopping chill of an early June swimming pool not yet heated by the dog days of summer. Bare feet tip-toeing through dew-soaked grass. Fan slapped air gently caressing one’s skin. Sun stung shoulders and faces, reddened and peeling from summer afternoons. Sweat soaked shirts clinging to arms and backs. The sour-sweet taste of an almost-ripe blackberry as it pops between the teeth. Dewdrops of nectar teased out of a honeysuckle bloom. Heart-red watermelon that satisfies both thirst and hunger. Homemade ice cream fresh from the churn with just a dash of rock salt from the ice. Georgia peach juice dribbling down the chin—the sweet fruit heavy on the tongue. S’more fire browned marshmallows and chocolate embraced by graham crackers. Steaming hotdogs fresh off the grill. Snow cones soaked with cherry, lime, grape, or tutti-frutti syrup. Tart lemonade in Dixie cups sold by youngsters in roadside stands. Use your five senses this summer. See, hear, smell, feel, and taste that the Lord is good. 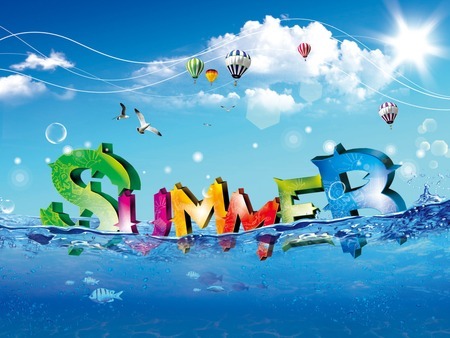 Bill, you have such a wonderful gift of finding just the right words to describe “summer”…..thanks for sharing this with us and blessing us with these reminders of summers past and present!